As promised, pictures of my skirt and dress. They hung in my closet for about 72 hours before I dared hemming them. It's one of my first tries at bias sewing and everything went well. It surely helped that I starched the kiwi green organza - it was really stiff and not slipppery at all. BWOF 05-2007-125. This chiffon skirt is as airy as a light summer breeze. Itâ€™s lined with cream-coloured crÃªpe de chine for modestyâ€™s sake. 36-46. I sized down from 36 to 34. Well the picture doesn't show very clearly the skirt. But the skirt I did sure looks like the technical drawing. I never follow the Burda instructions. They are quite confusing and vague anyway. Plus we have the Romanian version of Burda here and in my opinion, those who translate the instructions from German to Romanian have no idea about the sewing vocabulary, there are some very strange terms and sentences in there! I like the way the skirt flares at the bottom, it's very nice especially if the skirt is done in a flowy, drapey fabric. 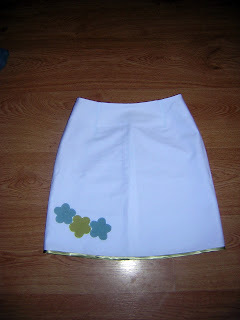 Kiwi green organza, used both for the skirt and the lining. I just sized down the skirt from 36 to 34 and did a petite alteration to the length. (I've made a fold of about 1 inch on the pattern, about 4 inches below the hip line. I cut the lining from the fashion fabric and treated both layers as one, including for darts that I sewed using the bobbin-thread technique to get a perfect point. I then sewed the invisible zipper and the side seams leaving the last 5 cm at the hem not sewn. I hung the garment and after that corrected the hemline, did a serger rolled hem on the lining part, sewed the side seams and did a narrow hem on the skirt. The waist is finished with a bias band cut from the fashion fabric, sewn to the waist, understitched, pressed, slipstiched to the zipper band and tacked to the darts. The finished width of the bias band is about 5/8 inches. 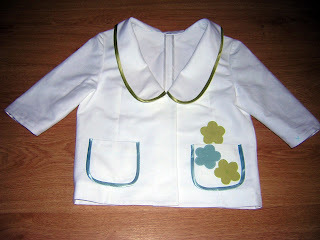 I will definitely sew it again, this time in a fabric that does not require a lining. Dress... I hope I don't look too much like a nurse in it, but summers are really hot here and wearing white surely helps. Vogue 7693. Dress, below mid-knee, has raised neckline, semi-fitted mock wrap bodice with right front extending into tie end, straight or bias skirt, slightly flared. Also, dress has back zipper and short, self-lined sleeves or long sleeves. A,B: Side front slit. E: Drape. I made view C.
6-22. I made a 6. The instructions were very easy to follow, I had no problem whatsoever. I am in love with wrap and mock wrap dressed and having made only knit wrap dresses and tops, I wanted to try a woven one as well. I also liked the little collar that goes high on the back neck, it gives a very flattering line to the front neckline as well. I also liked that the dress does not have a lot of cleavage, sometimes wrap items do. White linen with a bit of silk. It has a very nice texture (oblique threads, a bit like denim) and a silky touch that gives it the shiny appearance in the photo. No pattern alteration. The Vogue pattern stipulates a self-lining for the entire bodice and the sleeves (you cut 4 sleeves, two left front bodice, two right front bodices etc). I didn't want two layers of fabric for a hot summer dress so I ditched the self lining and finished the neckline, the tie and the waist line of the right front bodice (the one that flows free and is not sewn to the skirt) with premade satin bias tape. I've also shortened the dress. My version is not below mid-knee, but just above the knee. I thought this length is better for my short self. Yes I will sew it again. I'm thinking view D but with the long sleeves of View A, and in a thin wool or something of the sort, for autumn and winter. A shirt I've done for my husband. Meanwhile I've added a pocket too. It is a very very nice fabric, we call it here "melted" cotton, it's 100% percent cotton, very smooth and good quality, feels delicious next to the skin and is just a tiny bit sheer. It imitates the fabric used in traditional peasant blouses for women (which were natural silk - they were growing silk worms - woven in-house). Burda World of Fashion 04/2006, shirt 133. This poplin shirt should definitely be worn outside his trousers/pants so that the cut can be admired! It’s slightly shaped (now trendy), with an attractively curved hem and boasts those typical safari shoulder tabs. Yes, the part that I didn't change looks very much like the drawing. I didn't use the instructions, I used instead a very useful tutorial on Liana's blog Sew Intriguing - Go here and scroll down to the third post in November 2006 titled "Shirtmarking Information". 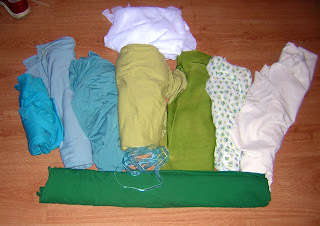 I've also used the burrito technique for both the collar with a stand and the cuff. I chose this pattern because of the closer to the body, curved shape. My husband started to like slimmer shirts, the kind that you can wear over your pants. It's 100% cotton and we call it in my country "melted cotton". It imitates the fabric used for Romanian traditional blouses, which was pure silk (from silk worms), woven in house. It is a very soft, great feeling next to the skin fabric and it's a tiny bit sheer. Very breathable and nice during the summer. Well, my husband wanted a long-sleeve shirt, so I added long sleeves copied after one of his favorite shirts. I ditched the epauletttes (he hates them) and the pockets. Meanwhile (after taking the pictures) I've added a single pocket to the shirt, the kind that is V shaped at the bottom. 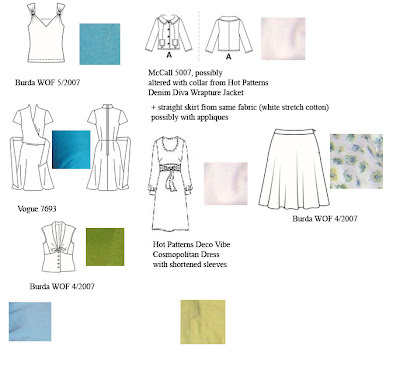 Actually it's item #5, I already did the organza kiwi skirt (Burda WOF 05/2007 - 125) and the white wrap dress (Vogue 7693) but as they are both cut on bias, they are hanging in my closet for another 24 hours before I can hem them. Burda World of Fashion 03/2007, top 120. Embroidered lace fabric and satin ribbon accentuating the empire line upgrade this romantic top into a trendy highlight. I don't read nor use Burda instructions, I just do it my way. Plus this pattern is really not difficult. I like the flowing bottom part, very much in trend nowadays, the feminine cut of the top and the ribbon detail. Beware the top has quite some cleavage, definitely more than in the photo (I thought that it's because I'm petite, but no, I couldn't have done a petite alteration, the darts fit me perfectly as they are! Well, it's not the first time I notice that Burda tops have more cleavage in real life than in magazine pictures) I like it this way, it is very nice for going out. During the day or in the office I just wear an elastic bustier underneath, that ends just below my breast (the type that you buy in bra shops). For the next top however I might add an inch all around starting from straps and therefore widening them and adding an inch to the neckline too. A nice and drapey viscose. 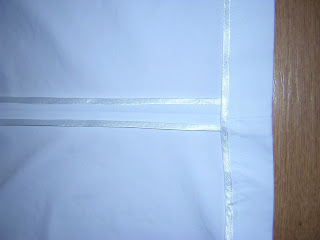 The bias binding is cut in organza, from the remnants of a skirt that you will see soon (is hanging in the closet before hemming, because it is cut on the bias). The top in the magazine is lined. Mine is not, I want it to be really flowy and easy to wear during very hot summers in Bucharest. Therefore I needed a finishing at armholes and neckline and I decided to bind them in the same kiwi organza that I did my PR SWAP skirt, thus coordinating the top with the skirt even better. The bias is folded, then sewed to the neckline, wrapped around it and then sewed in the ditch. I replaced the ribbon at the empire cut with an eyelet lace plus a piece of satin bias ribbon, both white. Didn't want green here too, it would have been to matchy-matchy IMHO. I've cut a 1 1/2 inch hem allowance and when trying the top, I discovered i like it longer, therefore only did a narrow hem. I will definitely sew it again, I like it very much, it is both trendy and feminine. Plus not very difficult to sew. I'm thinking of another flowy version (cotton batiste maybe) and one in a heavier lace, with lining, of course - more like an evening top. As I suspected from the initial stage of SWAP planning, the knots on the straps don't fit under the jacket. I like the top anyway and I am glad I have made it, but it doesn't go in my PR SWAP. Another view of the top - the colours show better but the damn flash in the mirror gives a strange lighting uf. I copy here the review I wrote for PR, in case you are interested in more details. Beginning sewers will have no problem making this sleek top as itâ€™s cut quite simply. Weâ€™ve knotted the straps to add interest. 36-44. I am a 34 so I sized down the pattern. 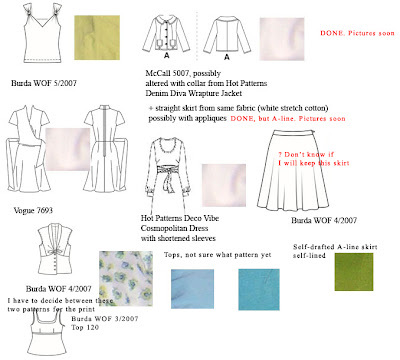 I never look at Burda instructions. I've started sewing in my teenage years, with Burda magazines in German (I don't speak a word of German!) and learned from my own mistakes. Now, I have the Romanian version of Burda, but I still don't look at the instructions, I do it my way, especially since everybody complains about their instructions being scarce and sometimes difficult to understand. 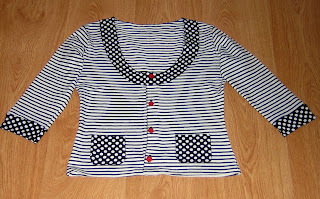 It's a very simple top that you can sew in one hour. I like very much the knotted straps which add an unique touch to an otherwise very simple top. Cotton/lycra jersey in a avocado/limegreen pale colour. First, I sized down the pattern from 36 to 34. Also, I sewed the straps to the back of the top normal and not gathered as indicated in the magazine. I just liked it more this way and didn't want the additional bulk. Last, I did quite a wide hem (1 and 3/8 inches) as the top was quite long. It is the first time I'm doing a wider hem on a knit top and I really like the way it looks. I will sew it again in a black cotton/lycra, it would make a nice top for going out and dancing. I definitely recommend it, it is easy to sew, quick and has an interesting design. I'm looking for a pattern for this kind of safari jacket. My sister's birthday is really close and she lives in Stockholm now, I would love to sew something for her. Does anyone know about a similar pattern? The jacket needs buttons which I need to buy (I'm working very late these days and notions shops close at 19.00 at the latest) and then make buttonholes. The jacket is McCall 5007 with the collar of the Hot Patterns Wrapture Jacket and 3/4 sleeves (I shortened the sleeves of 5007 and took 1 inch in at the side seams). The skirt is a self-drafted A-line, with an invisible zipper and at least this one is finished. 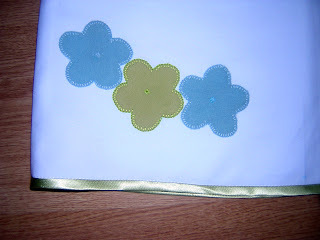 The bias binding is limegreen and blue, to match the appliqued flowers. The little flowers are cut from knit fabric that I will use for two tops, interfaced with knit fusible and sewed by machine. 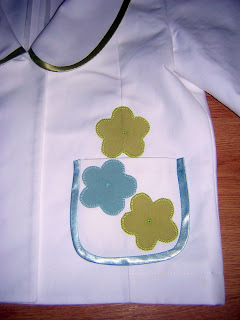 Detail of flowers on the jacket, two lime green and one blue. Both the skirt and jacket need washing (there are still marks of blue fade-away pen, sorry for that) and ironing therefore the bias binding does not look as nice as it will after a good pressing. Hong Kong finishing on the jacket (it is not lined so I wanted it to look nice). 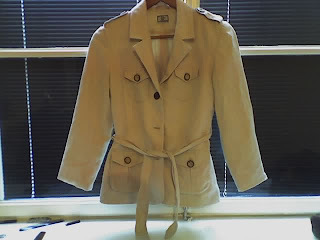 This is my review on PR for the jacket (go to the end, it is an update to an older review) and for the skirt. Of course, like in the Timmel SWAP, I keep changing my mind and my plan. But this is part of the fun for me, the creative little wheels inside my brain keep spinning once I have a plan that really appeals to me. Anyway, I've entered the SWAP on PR - see Rules here. Enter contest here. Remember when I said I was planning a new SWAP, one containing avocado greens, blue, aqua? Well it should be a good combination for this summer SWAP, I'm adding white too, I love white (and summers are sooo hot here) plus it suits me having black hair and medium to olive skin. I also know I want to make dresses, seeing all these dress SWAPs reminded me how much I like dresses and how few I have. So, for the time being, my plan is to make the version with 2 dresses, 5 tops, 3 bottoms and 1 jacket. Here is my provisional storyboard (see there are two fabrics still waiting for a pattern or idea) and my provisional title is Always Falling in Love at the Seaside.